Promotion of Muza SA publishing house and the Akurat imprint in social media; significant development of communication via Facebook, establishing communication in other channels from scratch; regular management of content in social media. The change of the manner of communication on the publishing house’s fanpage – 95 per cent of the content related exclusively to the client's books, original content in the form of drawings, content directed closely at the target group, creating favourable conditions for a dialogue with the audience. The fanpage of the publishing house Akurat targeted at young audience, light content, change of language. 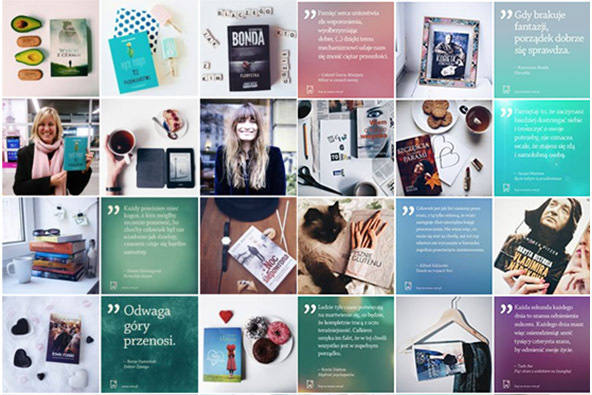 Creating Muza SA publishing house’s profile on Instagram and on Twitter. Creating campaigns for specific titles in different chanels. Muza SA’s account on Instagram has become Instagram’s most popular book profile in Poland (4500 followers) with lively interaction under each picture (400-500 likes). Original content related directly to Muza SA’a publications — attractive graphic depiction of quotations from the publishing house’s books as well as books in interesting stylizations. Competitions on Instagram generate on average 60 reposts on the profiles of book enthusiasts. Muza SA’s profile on Facebook recorded an increase in the number of fans by over 5000 per cent (from 2500 to 12500); Akurat’s profile recorded an increase by over 340 per cent (from 1400 to 5000). The fanbase was built by means of targeted campaigns as well as dynamic organic growth related to high interaction. Both fanpages are widely used in sales activities and they visibly contribute to improvement of the results of the muza.com.pl store. One of the projects for Muza SA publishing house in social media was a real time marketing campaign created for the purposes of the book titled “Doradca smaku” (Taste Advisor). Michel Moran’s Cooking Emergency Service (Pogotowie Kulinarne Michela Morana) was started on profiles dedicated to cooking. Within 24 hours (most often within several minutes) it produced a recipe for a delicious meal based on the content of the user's fridge. The recipe was accompanied with a link enabling the user to buy the book. Our another project was a campaign promoting a book (“Wiem o tobie wszystko” (I know all about you) on Tinder, which was the first such campaign run on Tinder. It generated over 500 positive responses from the users. Due to organic growth, Muza SA’s account on Twitter gained nearly 900 followers within six months. The main focus was on direct contact with the users.